On today’s show, we’re covering the Apple Macintosh, Steve Jobs’ publicly acknowledged attempt at delivering the Graphic User Interface to the general public. 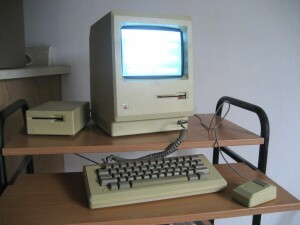 From the last show – Wikipedia: “Contrary to common belief, it was not the first personal computer to offer a graphical user interface in a machine aimed at individual business users. Development of the Lisa began in 1978. The Lisa sold poorly, with only 100,000 units sold. Jeff & David, along with our guest co-host Adam Rosen of the Vintage Mac Museum in Boston, MA, discuss some of the philosophies about the above statements, along with personally selected eBay favorites. Data recovered from Gene Roddenberry’s floppies—but what’s on them? 1984 Macintosh 128k In Original Box! Collectable Vintage Apple Macintosh Powerbook Duo 230 With Dock M7779 Works! Find all of our show notes at HistoryOfPersonalComputing.com. eBay Episode 6 – Apple Macintosh was posted on Friday, January 8th, 2016 at 7:48 am. This post is tagged Apple, Macintosh and is filed under . You can follow the replies through the comments feed. Pings are closed but you can Leave a comment! A Blueberryware theme › 37 queries in 0.387 seconds.